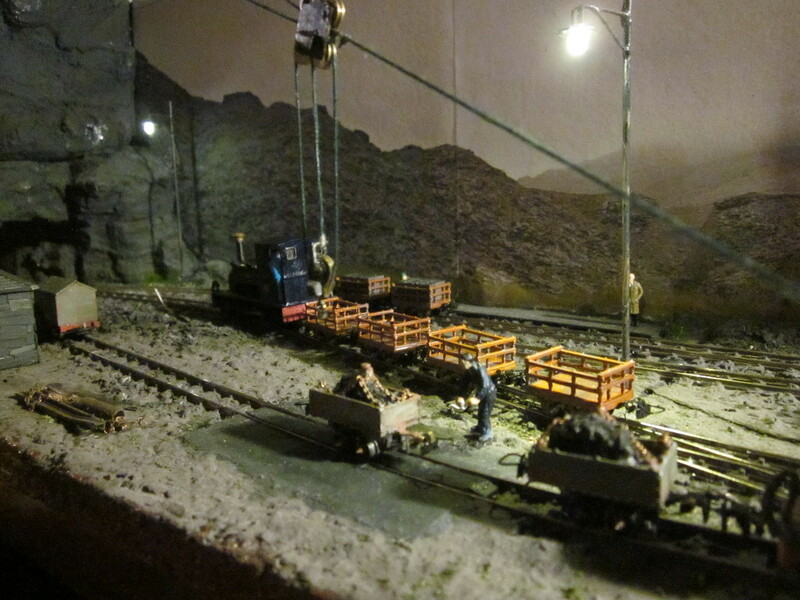 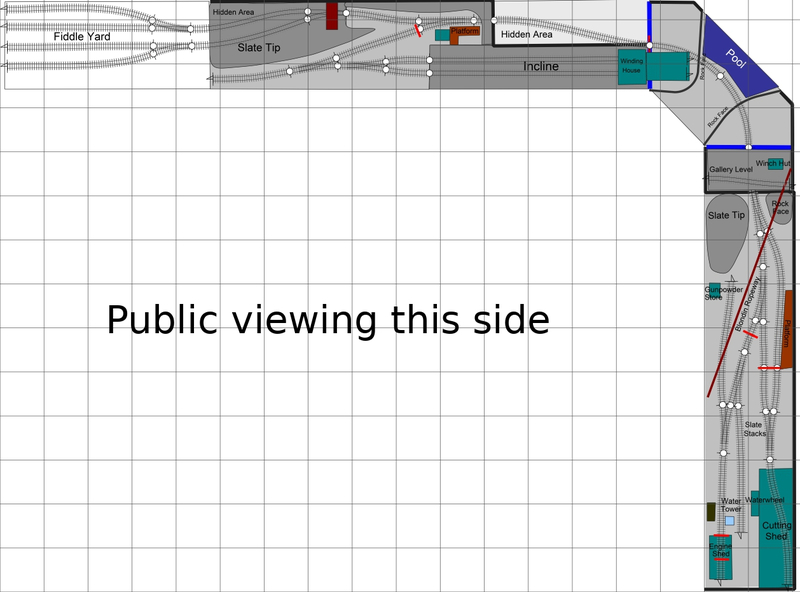 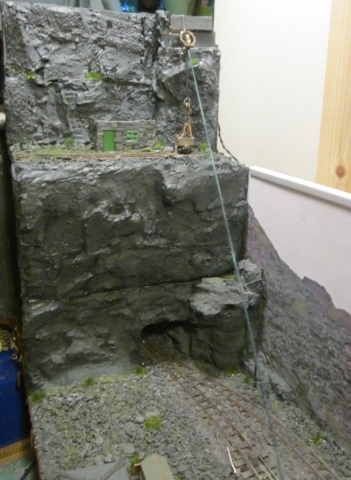 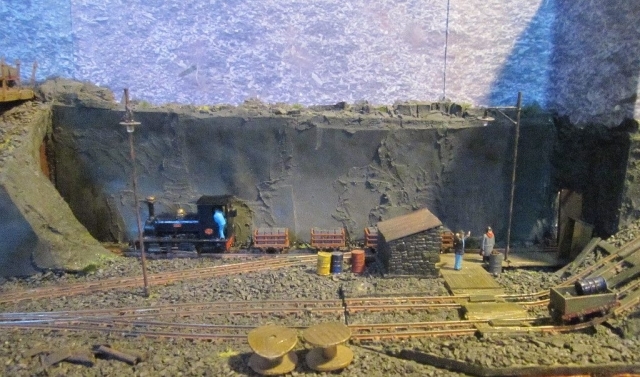 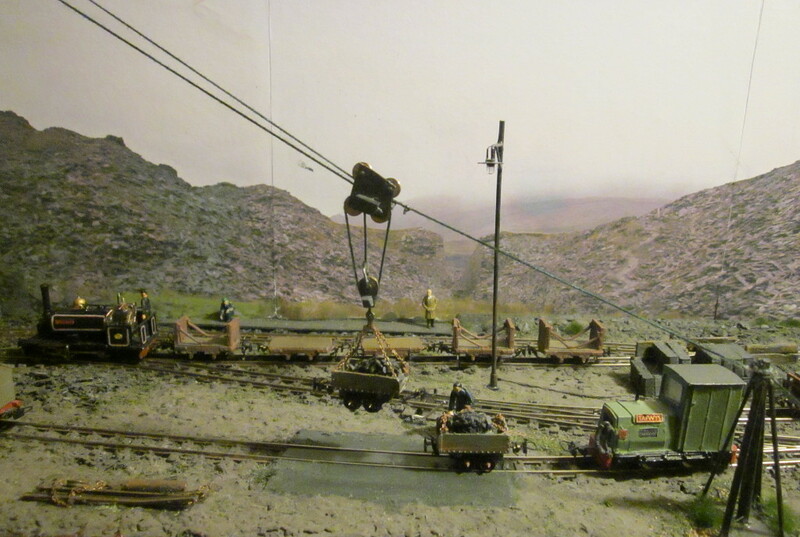 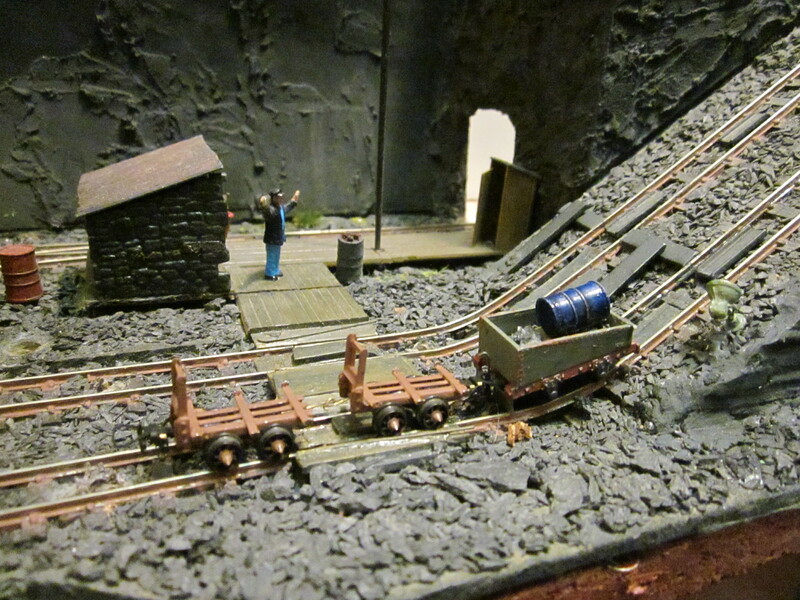 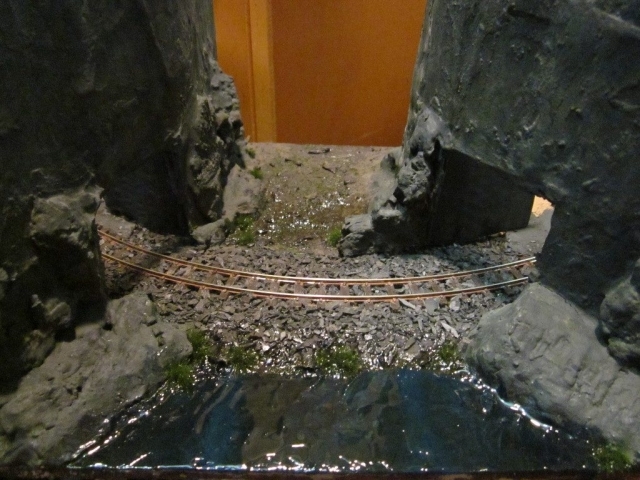 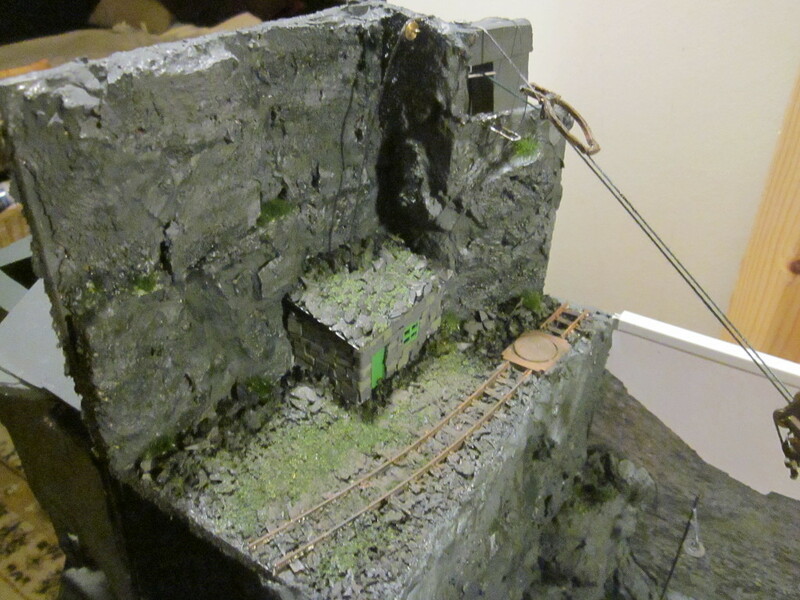 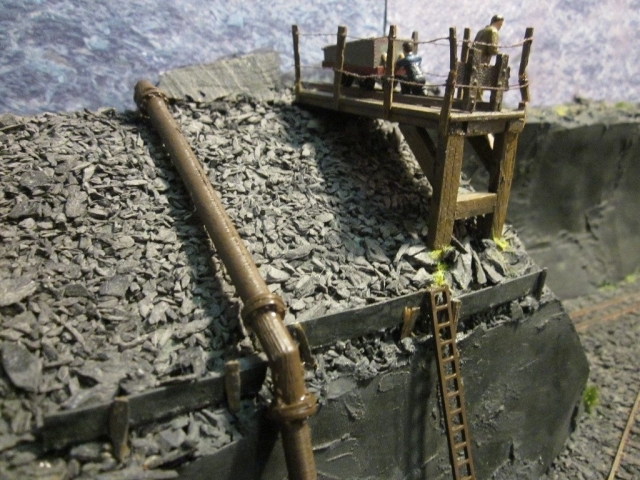 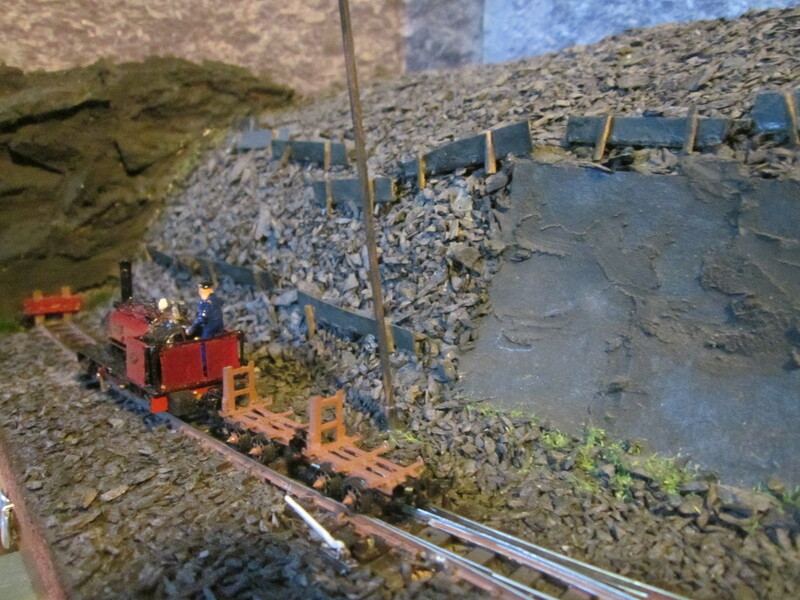 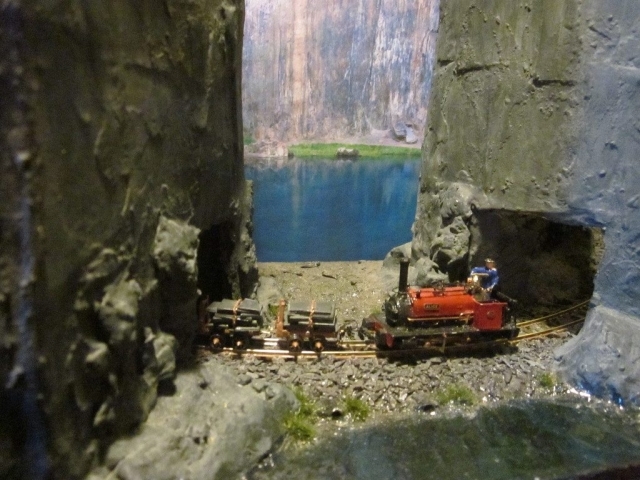 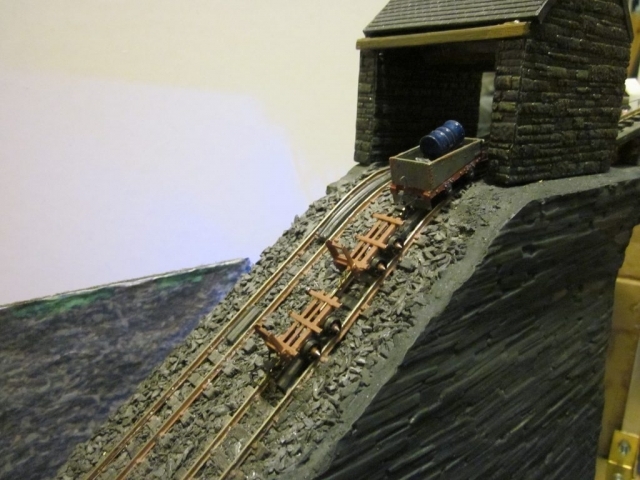 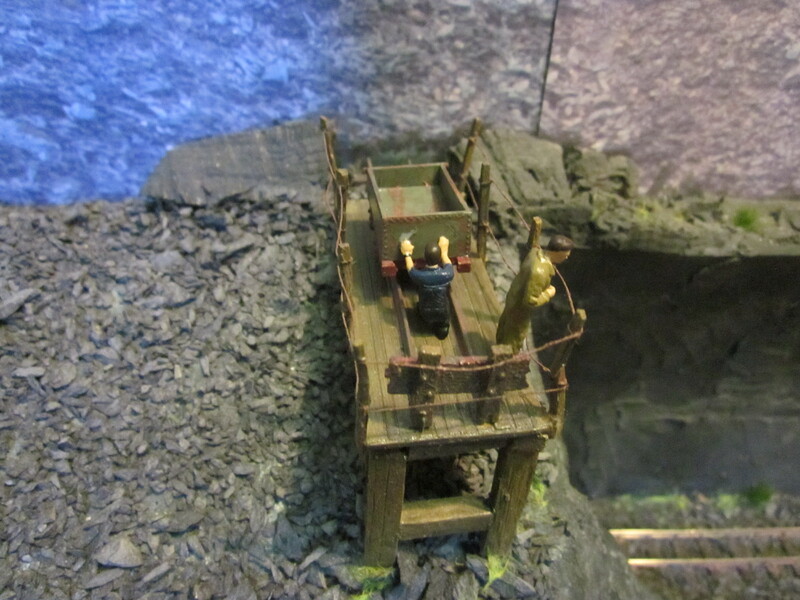 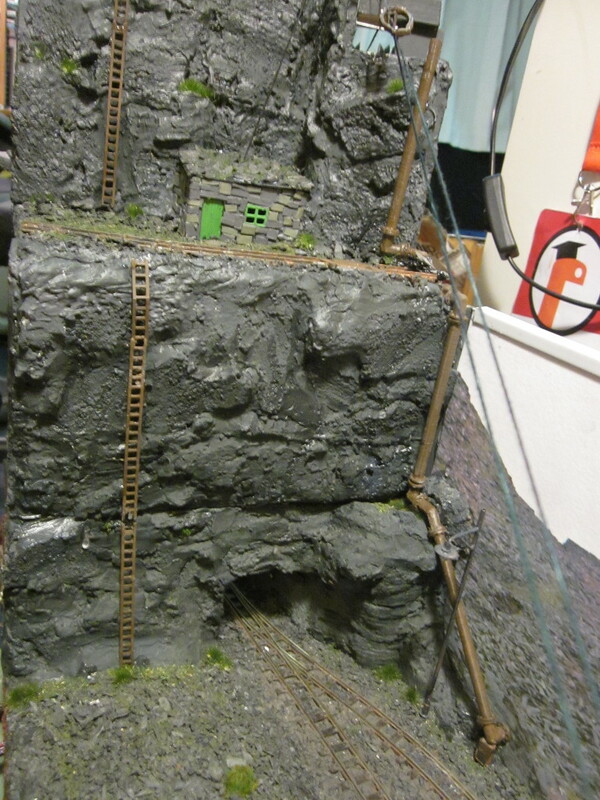 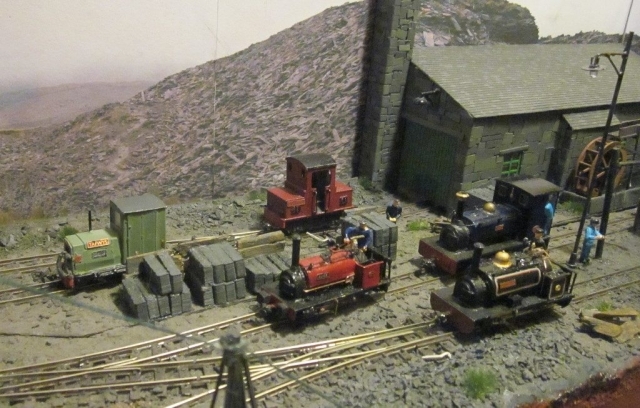 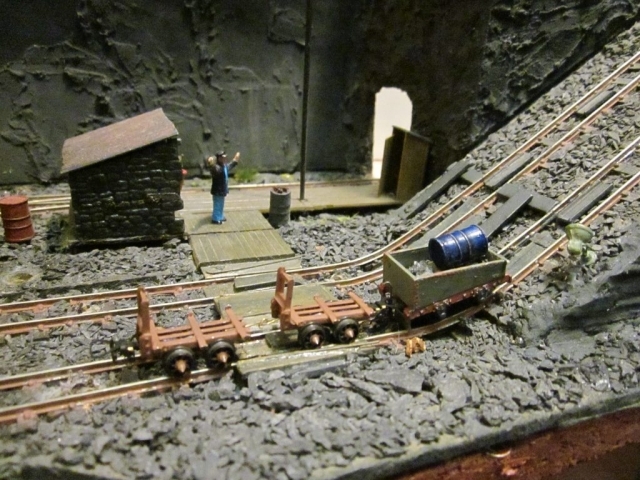 This 009 layout is intended to provide a representation of some aspects of slate quarry operation, it is not intended as an authentic recreation of a slate mine. 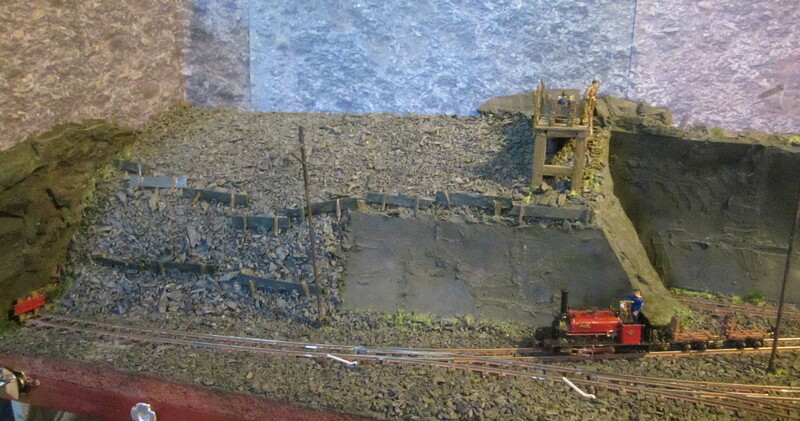 The period of the layout is “indistinct”, it could either be an operating quarry nearing the end of it’s working life (approx 1950’s), or a “present day” mining museum with working exhibits demonstrating quarry operations and occasional slate extraction for the production of souvenirs. The slate incline is used to bring large slate slabs down from the upper levels of the quarry for splitting in the cutting shed. 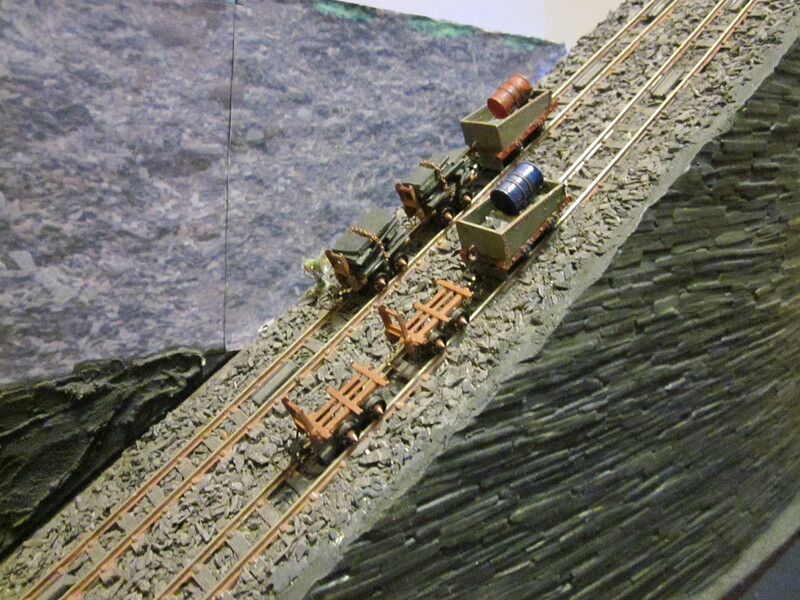 The incline works by gravity, with loaded wagons at the top being used to haul empty wagons up from the bottom. The model uses two permanently attached and weighted slate waste wagons for operational reasons, but in reality this would not have been the case. 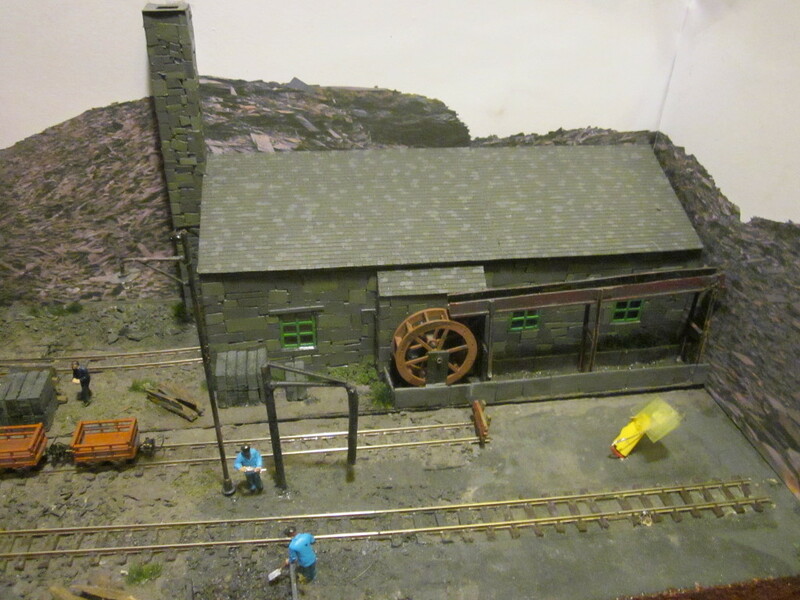 The cutting shed (with an operational sliding door) where slates were processed into roof tiles. This features a working water wheel, which would have powered the machinery inside the cutting shed through a system of belts and pulleys. The actual slate splitting was carried out by hand. 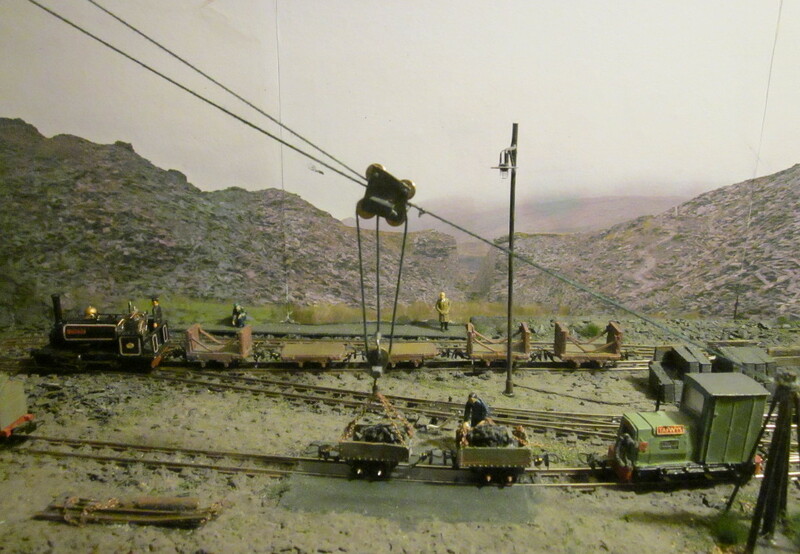 Waste slate from the cutting process is removed in slate waste wagons, which in this case are transported to the tips using a Blondin ropeway. The ropeway (named after the 19th century French tightrope walker Charles Blondin) was an alternative to the incline for transporting wagons between different levels of the quarry. 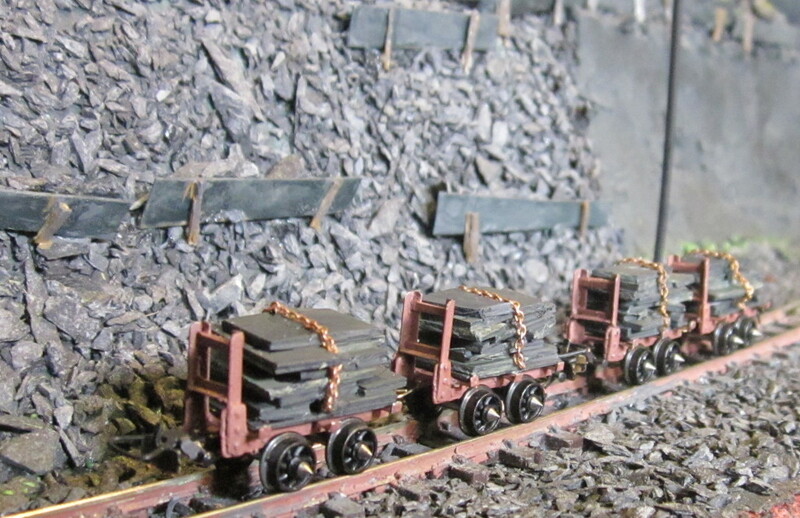 Cut slates are loaded into wagons for transport out of the quarry to the wider world. 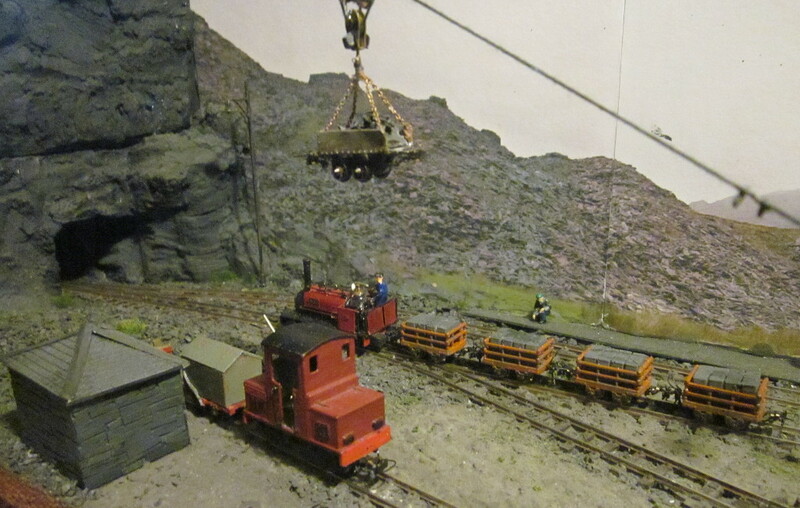 The onward shipment of slates varied from quarry to quarry. For a quarry served by a narrow gauge line, loaded slate wagons would be removed from the quarry (often via a further incline) and assembled into longer trains which would then be taken down the “main line”. Workman’s trains bring in quarrymen from the local village, or museum visitors depending on the era! The small building close to the bottom of the Blondin ropeway is a gunpowder store, where the powder used for blasting slate would be stored prior to being taken to the quarry face. 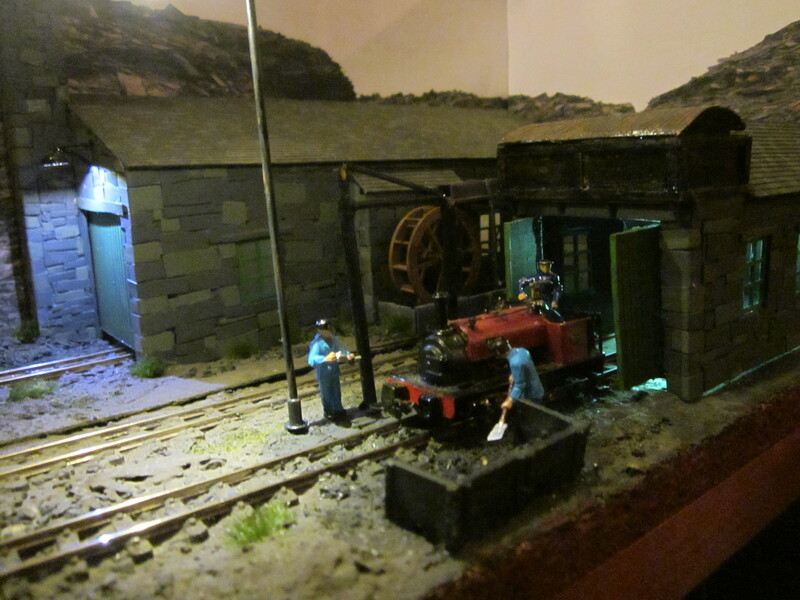 Loco shed with working doors where the engines are serviced. Some narrow gauge railways were built on a continuous falling gradient, allowing full slate trains to descend by gravity. 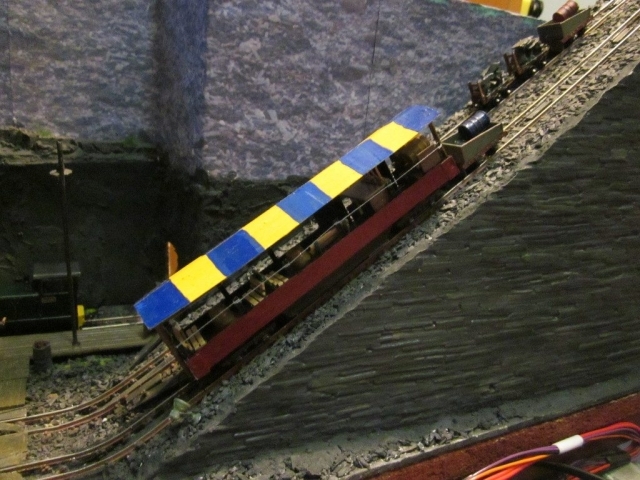 A gravity slate train can be simulated in model form, but it would not normally have operated within the bounds of the quarry due to the lack of a consistent falling gradient. 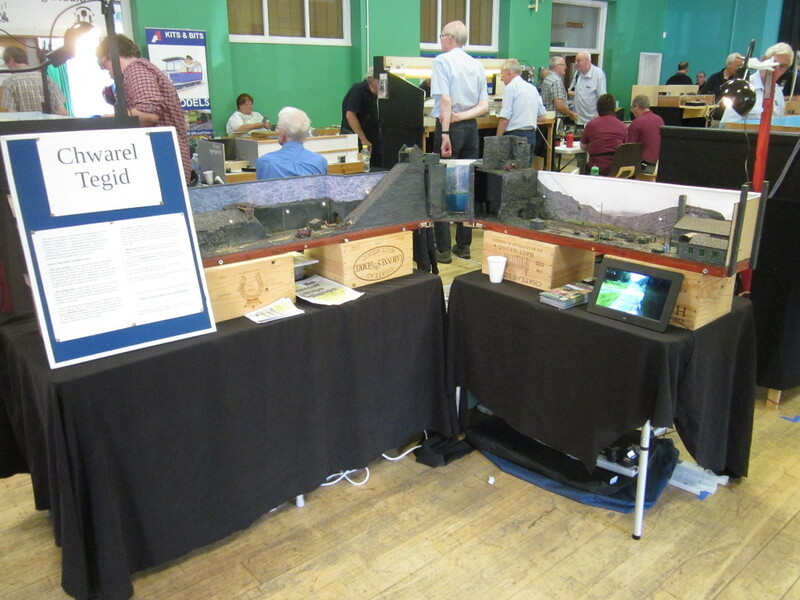 The Chwarel Tegid build is fully documented on the NGRM Online forum (user tim1mw), please visit to find out more (login required)! Chwarel Tegid has made a number of appearances in 009 News in the photo pages, as well as a detailed article on the construction of the incline and ropeway. 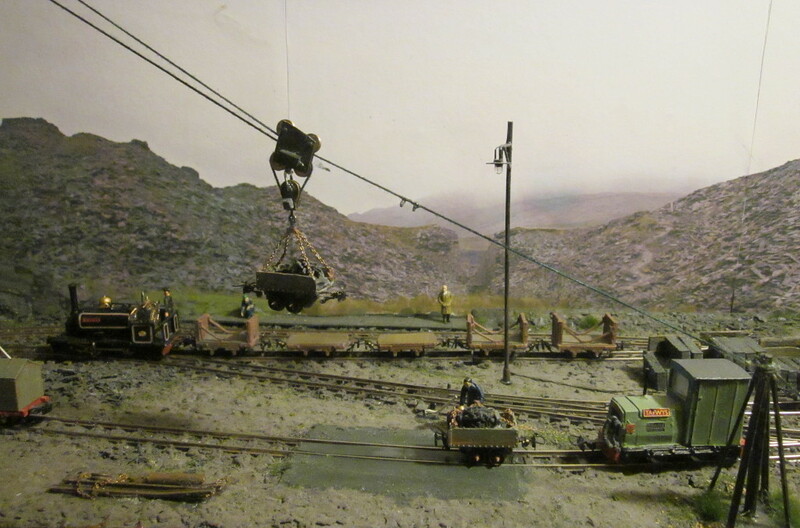 This video shows a range of operations on Chwarel Tegid, including the incline and Blondin Ropeway. Welsh National Slate Museum, Llanberis, 27th February to 1st March 2019. Telford Railway Modellers Group Exhibition, Charlton School, Wellington, TF1 3DY, 6th October 2018. 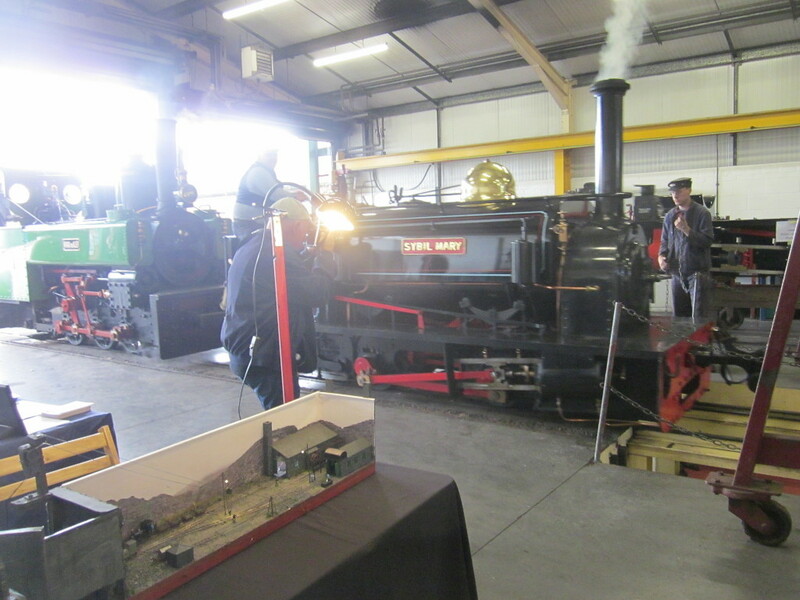 009 Society East Midlands Members day, Mansfield, 14th July 2018. 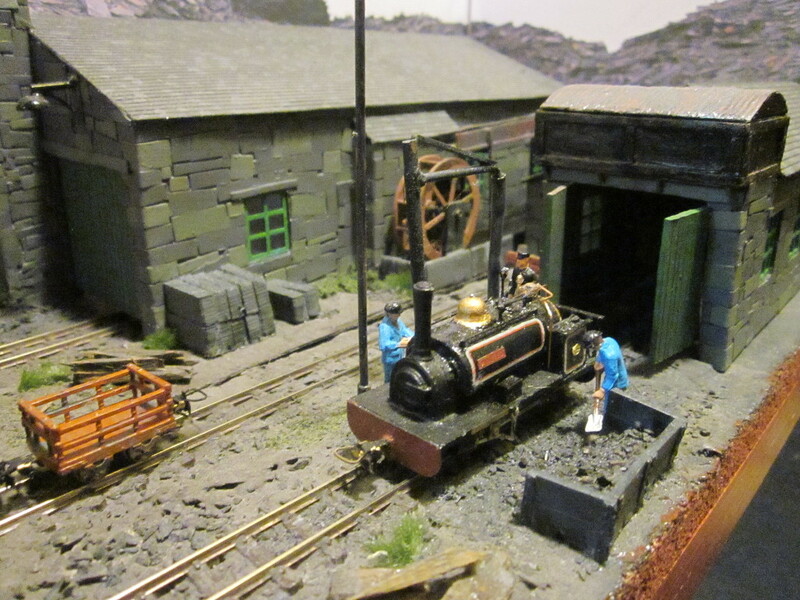 Great Little Trains Model Show, Bala N. Wales, 26th – 28th May 2018. 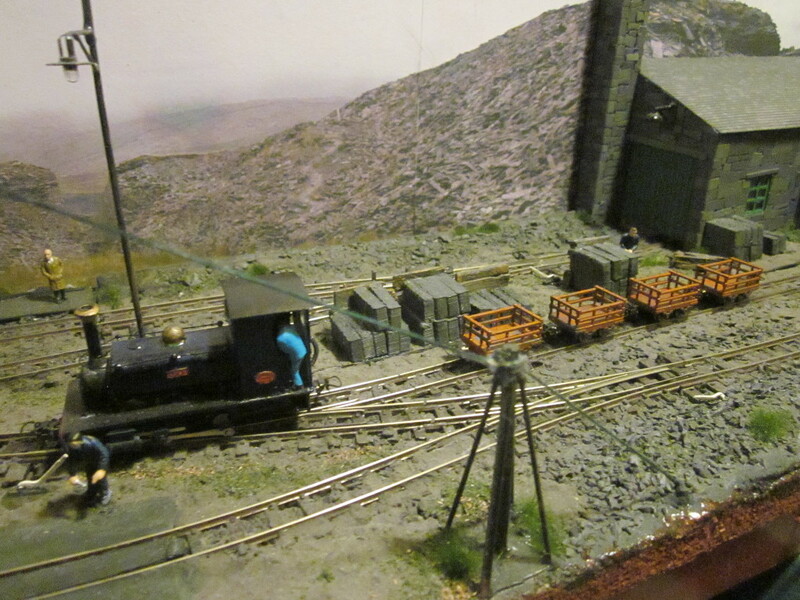 Please email tim_mw@yahoo.co.uk to contact me regarding Chwarel Tegid, or message me via the NGRM forum (user tim1mw). 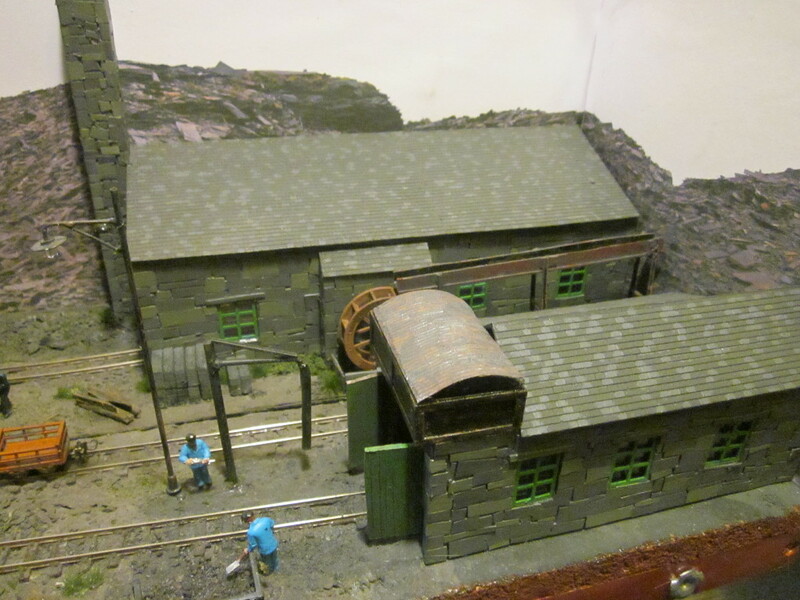 The videos below were filmed at an earlier stage of Chwarel Tegid’s construction and are retained for reference. 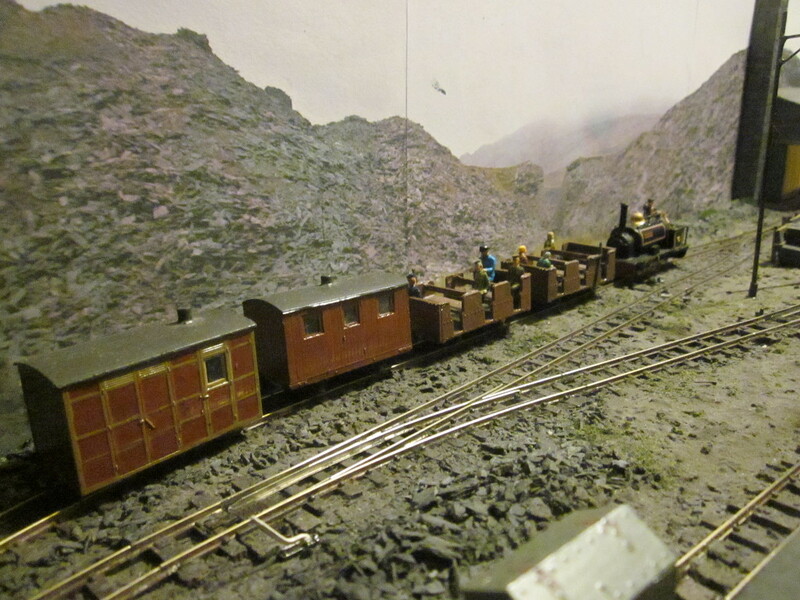 This video shows the Chwarel Tegid incline, shunted by Ruston 48DL “Tafwys”. It was filmed prior to my acquisition of suitable Car Cyrn. 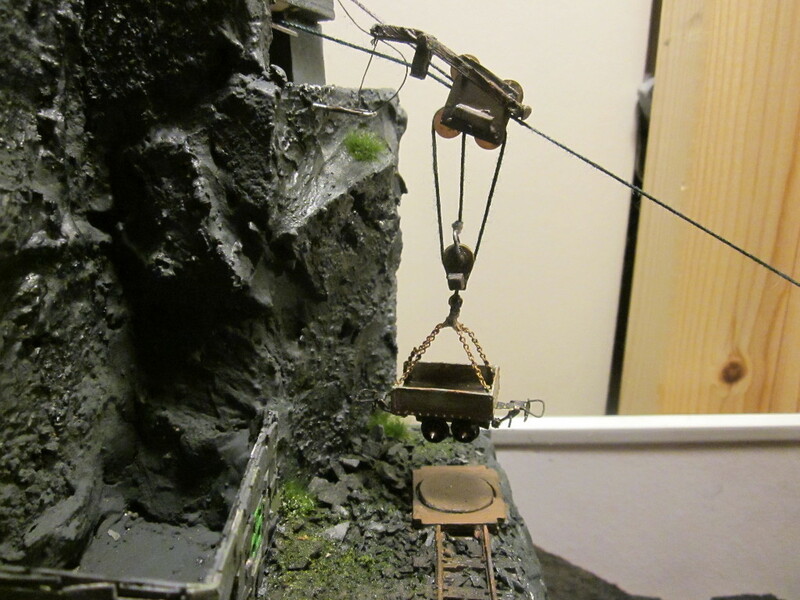 The video shows the Blondin Ropeway in operation, shunted by Quarry Hunslet “Alice”.